Victory!! 8 MILLION DOLLARS for GA School Workers! We couldn't have done it with out your support! All of your work, actions, calls, prayers, struggling, pushing and pulling has all, finally, paid off!! Yesterday evening on this historic anniversary of Dr. King's assassination, workers have won a massive victory in the State of GA! Due to our efforts Mark Butler, the GA Labor Commissioner, is required pay back more than 8 MILLION DOLLARS in unemployment compensation to school workers who were unlawfully denied their benefits last year. Furthermore, we were able to reverse Mark Butler's unlawful rule change that denied these workers their fair compensation. School workers throughout the State of GA are now eligible again to recieve unemployment benefits during school breaks including this year's upcoming summer break. Finally, through all this struggle Mark Butler showed has some semblance of respect for the workers. Quoted in the Rome News Tribune he said: "These workers deserve to be paid year-round just like their publicly-employed counterparts. Instead, their employers underpay them...". 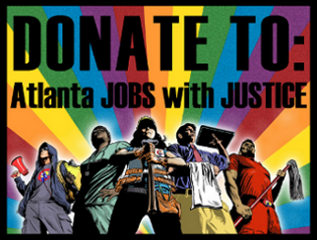 However we must not get complacent, Mark Butler has publicly stated in the Atlanta Journal Constitution that he will seek to deny these workers their unemployment benefits again next year by passing a bill similar to SB227/HB361. SB227/HB361 would have made the denials of unemployment benefits for school workers permanent under GA law, however from your support we were recently able to prevent this bill from passing. We must be vigilant and remain strong together to stand up to any attacks from Mark Butler and others who seek to attack hard working people and deny them rights and dignity. Lastly, we must congratulate all the hardworking school workers who stood strong during this difficult year and struck with the struggle everyday. 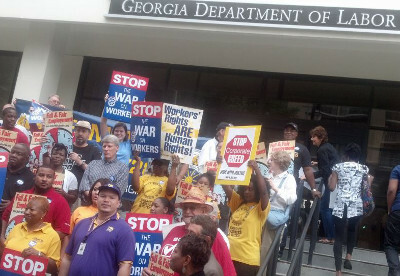 Also, we must thank the US Department of Labor for standing up for struggling workers in GA and for requiring that GA Labor Commissioner Mark Butler return the earned unemployment benefits that were owed to the school workers.